Installation of seasonally removable fenders and ladders for Nome bulkheads, replacing fendering systems damaged by ice along the East and South Docks. Damaged ladders were repaired and modified to be seasonally removable in some locations. Four new ladders were fabricated and installed. 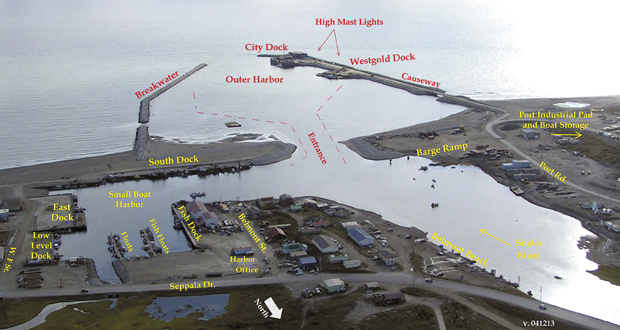 Installation of harbor lighting at the Nome float gangway and along the Low Level Dock and East and South Dock bulkhead wall called for both a weldment to attach some light poles directly to the bulkhead walls and for a reinforced contrete foundation for the remaining light poles.